The Hmong people migrated into the Indochina region from China. Although they are not the largest minority group in the region, their beautiful clothing and culture makes them one of the most interesting. 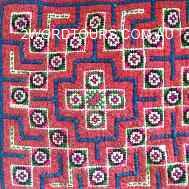 The style of their clothing varies from village to village and the colours, decoration and style of their garments denotes the name of their clan for example the Flower, Black, Red and Green and White Hmong. Skirts, jackets, jewellery, hairstyles and head dresses all vary from clan to clan and village to village. Each village tends to have their own individual style with everyone in the village following the style to the letter. There is no individual style – if one woman changes her dress the entire clan in the village follows. According to history, the Hmong in China were forbidden to use their ancient Hmong script made up of picture symbols (paj ntaub). So in order to communicate women started sewing the symbols of the script into their skirts, disguising them as patterns in the garments. 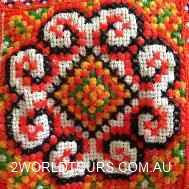 This practice over time created the distinct and colourful Hmong embroidery style. 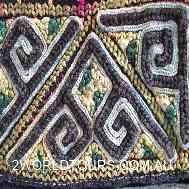 Although the methods used in making Hmong clothes have changed over time, with cotton and synthetic fabrics replacing the use of traditional hemp fabrics, the elaborate decoration of the and distinctive skirts and jackets of the Hmong in the remote villages of Northern Vietnam is still prevalent today. 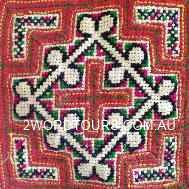 Appliqué, reverse appliqué (Pan dau) and batik are used in combination with cross stitch, chain stitch, running stitch, and a form of satin stitch used to create the symbols and shapes of Hmong designs. 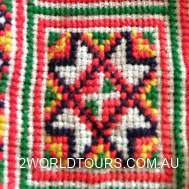 Many of the symbols have been stylised and modified into new designs and overtime been interpreted differently by each clan, however the basic shapes of the symbols remain unchanged and are easily identified in the embroidery of all the Hmong clans throughout the region of IndoChina. The making of clothing and textiles is exclusively left to the women of the family. Every free moment between working in the fields, taking care of the house and the children is spent making clothes and embroidering. 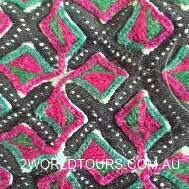 From six or seven girls learn to sew and embroider from their mothers, and by the time a girl reaches adulthood she usually has a full trousseau of beautiful embroidered outfits. When a girl reaches a marriageable age she always wears her most beautiful clothes to market or social gatherings to show potential suitors the quality of her sewing. The quality and quantity of clothing a woman has and her ability to sew signifies the wealth and status of her family and is held in high regard when it comes to finding a partner. Hmong women in the villages of Northern Vietnam like to look elegant at all times. Even when working in the fields a woman will either take an older skirt in a basket to change into, or turn her skirt inside out to protect the skirt and ensure that she always looks at her best coming and going to the fields. 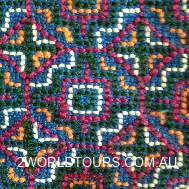 Symbolic embroidery is also used in other household textiles such as baby carriers and children's hats and clothing. Baby carriers are usually given to a bride by her mother to promote the birth of many children and in order to protect a baby's soul, the carrier a long with children's hats are decorated with tufts of brightly coloured yarn, appliqués and embroidered motifs in order to disguise the child as a flower so that evil spirits will not disturb the soul of the child. 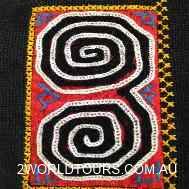 Mothers also sew symbols and motifs into the collars of a child's clothing to protect it from evil spirits. 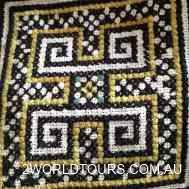 Symbols are also sewn into the clothing of sharman or healers so that they can 'sneak' good spirits into a room and ward off sickness and evil spirits. 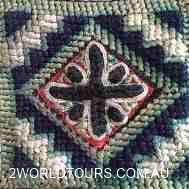 There are several symbols which are recognizable across clans and across countries. 4 steps represents a house. A leaf or frond - represents the hemp plant which is a very important plant for making textiles and providing clothing.